Columbia officials have approved the route of a walking trail to honor the city's black history. . . . The project includes 21 historical markers, some of which are already in place. The trail's first marker memorializes Sharp End, the historic black business district that was demolished in the 1960s during the city's urban renewal process. The route will pass other famous spots, such as the home of African-American composer and pianist J.W. "Blind" Boone. MoBikeFed comment: The project was unanimously approved by the Columbia City Council. Historic walking tours of this type have become increasingly popular in communities across Missouri. 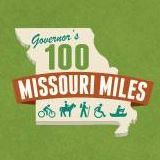 The Missouri Bicycle & Pedestrian Federation has been working with the Adventure Cycling Association and a large number of local organizations, communities, and agencies to develop a new major national bicycle route across Missouri. USBR 51 is a major new cross-country bicycle touring route from New Orleans to Minnesota. The route through Missouri is currently under development and already partly usable. The route through Missouri will consist of a (mostly) on-road bicycle touring route stretching from Fayetteville Arkansas to the Iowa border, along with an off-road "Butterfield Stage Off-Road Experience" route connecting Fort Smith Arkansas with Jefferson City, Missouri. We have made this information available so that people interested in bicycling these areas can used route planning materials available, and also to open up planning materials for public response and feedback. The Johnson County Spirit Trail Coalition . . . received the go-ahead to advertise for paving bids for the trail . . . Coalition members also discussed the next phase of trail building in the county. The coalition currently does not have a Warrensburg representative since Marvin Coleman, director of Public Works, resigned from the group. The coalition has approached the City of Knob Noster about extending the trail from Whiteman Air Force Base into that city, and also is considering how to extend it south from Warrensburg to Leeton and Chilhowee to link up with the Rock Island Trail that runs across southern Johnson County. Lucas said the group has to prioritize which route to do first. Board Secretary Sallie Ashe said, rather than taking the trail south along highway right of way, the trail could follow some chip and seal county roads to Leeton to avoid traffic. “I like the idea of having a good chip and seal road,” Gabel said, adding the county will look at the route and determine if bike lanes can be built on road shoulders. MoBikeFed comment: The Spirit Trail currently extends from Warrensburg to Knob Noster State Park, about couple of miles from Whiteman AFB. A portion of the trail is paved, but the majority--which opened just in Fall 2018--is soft surfaced. Missouri Rock Island Trail, Inc., (MoRIT) supporters heard positive feedback from Pat Curry, author of the “Rock Island Trail Opportunity Analysis” at the annual March 28 meeting, but Missouri State Parks (MSP) Deputy Director Mike Sutherland continues to deliver warnings about the state’s ability to support the endeavor. “It’s a no brainer to accept the trail,” Curry told a group of 50 or more trail supporters present from Owensville, Belle, Eldon, Jefferson City, Cook County and Windsor to name a few. MoRIT Executive Director Greg Harris hired Curry, who works for the University of Missouri Extension, to do a third-party analysis of the impact the 144-miles of Rock Island Trail could have on more than 30 communities that it runs through. “I have seen the transformative impact trails can have on communities,” Curry said. “Trail-based operations drives more outdoor activities than anything else.” . . . The signs are all over most cities — stretches of road without crosswalks and people needing to walk on roads built for rush-hour traffic. But the real increase, experts say, comes from larger trends: drivers and pedestrians distracted by their phones and a growth of larger vehicles on the road. MoBikeFed comment: Missouri is not immune from this trend--in fact, some of the highest pedestrian death rates in the country are found in areas of Missouri. Bicycle/pedestrian safety and proposed distracted driving legislation are two of the legislative priorities we will be discussing at Bicycle, Pedestrian, and Trails Day at the Capitol on Tuesday, April 23rd, 2019, in Jefferson City. The leader of the Missouri Senate said Thursday that lawmakers had reached a “breakthrough” in negotiations over a multimillion-dollar plan to boost infrastructure spending in the state. The compromise — developed between Senate GOP leadership and members of the Senate Conservative Caucus — was reached after days of negotiations among the two Republican factions, House leadership and Gov. Mike Parson’s office. . . .
Schatz said the bonding would begin in fiscal 2021 and that the money would be paid back over seven years. He said the state would have to appropriate about $46.1 million per year to pay back the loan, and would ultimately pay $22.6 million in interest over the seven-year period. The proposal also would devote $50 million in general revenue next fiscal year to “jump-start” the governor’s bridge replacement program, Schatz said. An additional $35 million would go toward a cost-share program for infrastructure improvements with counties and cities. However, the General Assembly has still made no significant progress on creating any sort of dedicated funding for multi-modal transportation in Missouri. The Missouri House on Tuesday endorsed the creation of a private endowment that would help fund a proposed 144-mile bike trail across the state. Ameren and the Department of Natural Resources are negotiating the donation of a former rail line that an Ameren subsidiary owns, but the DNR has raised concerns about the cost of running what would be known as the Rock Island Trail. The former rail line, stretching from Beaufort in Franklin County to Windsor in western Missouri, would resemble the Katy Trail, another former rail line popular with hikers and cyclists. The two trails would meet at Windsor. MoBikeFed comment: The bills proposing the Rock Island State Park Endowment Fund have been proposed by Senator Mike Bernskoetter and Representative David Wood. Both of them represent large areas of the proposed 144-mile Rock Island Trail State Park. Both House and Senate versions of the bills have been heard in committee now, and both have passed out of committee by unanimous votes. Now the bill has passed the full House as well. So it is moving forward quickly--but the Senate is always the slower and more difficult chamber to deal with. Representatives of the Missouri Rock Island Trail, Inc, the Missouri Bicycle & Pedestrian Federation, Missouri State Parks, and several other supporting organizations testified at the hearings in favor of the bills. Now it is a race against the calendar to see if the bill can be passed in he remaining few weeks of the legislative session. Jackson County announced the first of two phases of the Rock Island Rail Corridor recreational trail would open by the end of the November 2018 with the second phase to be completed by the end of this year. Now, the county is facing a mediation with nearby landowners after the Federal Surface Transportation Board questioned the county's honesty about how the land was acquired earlier this month. The landowners have lawsuits pending against the county in both the United States Court of Federal Claims and Missouri State Court. They want the county to either return their property used for an easement for the Union Pacific Railroad or to pay them for it. The area in question is 17.7 miles of rail line and the surrounding area, which Jackson County purchased from the Union Pacific Railroad following an agreement in 2015. MoBikeFed comment: The KSHB article suggests the 17.7 mile Jackson County portion of the Rock Island Trail is "in jeopardy". But it is unlikely the trail or corridor is truly "in jeopardy". Rather, discussions are ongoing about compensation of adjoining landowners for use of the corridor, given the way this portion of the corridor was acquired. Landowners and the Rock Island Corridor Authority are very likely to arrive at an agreement satisfactory to both sides--in time. This is the westernmost section of the Rock Island corridor nearest Kansas City. Texting and driving is perfectly legal in Missouri, as it remains one of three states without a full texting and driving ban. The other two states include Arizona and Montana. . . .
Missouri Senator Wayne Wallingford said texting and dangerous is incredibly dangerous, which is why he's proposed a bill to ban it across the state. "You can't make decisions as easily if you're concentrating on something else, your reaction time is going to be slower," Wallingford said. "I think the safety of this bill to save lives is self-evident." He said he knows people think they can text and drive at the same time, but he said the truth is, that we have "multitasking gadgets and unitasking minds." Wallingford's bill Senate Bill 15 would ban all drivers from texting and driving, even while at a traffic light or stop sign. MoBikeFed comment: Distracted driving--including texting while driving and other electronic device use while driving--will be one of the things we're talking with Missouri state legislators about at Bicycle, Pedestrian, and Trails Day at the Capitol on Tuesday, April 23rd, 2019. Those who like to walk in the Pleasant Valley Nature Preserve near High Ridge will get to double their pleasure later this year. . . .
“The trails that are there now are mulch and dirt,” parks director Tim Pigg said. “Our plans were, in addition to doubling the length of the main trail, it will have a compacted gravel surface. Now, we’re expanding some of the other trails, relocating some and abandoning some of the older ones.” . . . He said making the trail improvements answers a top request from the public. MoBikeFed comment: The most recent Statewide Comprehensive Outdoor Plan (SCORP) for Missouri surveyed Missourians about their outdoor recreation needs, and found that using trails and safe places to walk and bicycle is one of the most popular current activities and requested activities. So kudos to agencies like Jefferson County Parks who hear and respond when citizens raise these important concerns. After its controversial decision to sell 135 acres it owns on the bluffs overlooking the Missouri River to a housing developer, the University of Missouri said Friday it wants to preserve 100 acres in St. Charles County not slated for new housing. The university is seeking public agencies willing to buy the roughly 200 acres containing the Missouri Bluffs Golf Club and an additional 100 adjacent acres just west of Highway 40 (Interstate 64) in unincorporated St. Charles County. The university said 46 of those acres along the Katy Trail would be restricted for use as trails and public space. All 100 acres would be open to the public. . . .
“We have attended several public meetings and met with many interested parties about the future of this land,” Kevin Hogg, the university’s director of real estate and business services said in a statement. “After listening to the feedback, we determined that the best action was to offer this property for sale to public entities with specific development restrictions as part of any contract. This will guarantee the land remains in a natural state for generations of Missourians.” . . . Many Katy Trail enthusiasts and conservation advocates decried the university’s move, first announced in late 2017. St. Charles County’s Planning and Zoning Commission recommended against the housing plan. But the St. Charles County Council overrode that decision in June. Springfield City Council members unanimously approved an ordinance that will create new trail connections and sidewalks, earlier this week. There are five separate projects within the ordinance, two of which are in the Galloway Village Neighborhood. The first of the Galloway projects is a sidewalk connection for Greenwood Street to the Galloway Trail. That project also includes a new traffic signal at the intersection. The second Galloway project in the ordinance is some reconstruction for a portion of trail between Republic Road and Sequiota Park. The third and fourth projects in the ordinance are near the Fassnight Creek Greenway. One will work to connect Jefferson Avenue to Phelps Grove Park, while the other will build a half a mile of new sidewalk on Luster Avenue from Sunset Drive to Seminole Street. The final project outlined in the ordinance is a new sidewalk for neighborhoods south of Farmers Park. The new sidewalk would travel down Harvard Avenue from Swallow Street to Aladdin Court, measuring about a half a mile. MoBikeFed comment: City officials said that these sidewalk and trail connections were prioritized because citizens were asking for them. Citizens working together to ask for better walking and bicycling connections in their communities carries a lot of weight with city officials.